Five years ago, when the Congress had finalised Pranab Mukherjee as its choice for the 13th president of India, the news-hungry media was eager to know if he had agreed. One day, he gave in to the persistent queries, saying, “I am a diabetic and would love to have long walks on the lawns of Rashtrapati Bhavan.” Soon, Mukherjee was made president and, away from the rough-and-tumble of the political offices associated with for nearly six decades, he began to enjoy long walks on the manicured lawns of his 340-room house atop Raisina Hill. Even in the face of a regime change in the middle of his term, Mukherjee maintained exemplary poise and carried on a beautiful functional relationship with prime minister Narendra Modi of the BJP, a party at the ideological opposite pole of the Congress, in which Mukherjee had spent most of his political career. In such a situation, it helped that when Mukherjee stepped into Rashtrapati Bhavan as president on July 25, 2012, as an occupant for five years, he came in with his goals well set out. Mukherjee was no stranger to Rashtrapati Bhavan: in his capacity as senior Congress leader and minister, he had visited it several times. (In fact, no stranger to its grandeur and glamour, he had once joked to his sister that he wouldn’t mind being a horse at the presidential palace.) So when the opportunity arrived to be at Rashtrapati Bhavan as president, he had a blueprint ready for this non-political swansong to his long public career: as a people’s person, he decided he would open it to the public in all its opulence and weighty historical relevance. Omita Paul, the president’s secretary, who has been associated with him over many years, recalls his first day in office in a commemorative volume, Life at Rashtrapati Bhavan: “On July 25, 2012 itself, president Mukherjee told us that Rashtrapati Bhavan belongs to the people and should be democratised to give easy access to the public. He wanted the people of India to be able to come and experience this magnificent building and its rich legacy, not as a colonial relic but as an inalienable part of their history and culture.” Since Mukherjee threw open the doors of the Bhavan to the public, more than three lakh visitors have come to admire its splendour. This has also generated revenue of Rs 15 crore so far. The South Drawing Room, which was being used as a dumping ground, was brought to life with paintings and artifacts of the 1900s adorning its walls, nooks and corners. In the library, a table made in 1930 was placed back and the bookshelves were rearranged to highlight the artwork of the floor. The Durbar Hall was cleared of old furniture and other items. Its marble and stone pillars were spruced up, and now, original paintings of national leaders adorn the walls. Special lighting has been installed in niches to improve the room’s grandeur. By the late 1980s, the guest wing of the Bhavan had been abandoned as abode for visiting foreign dignitaries. It has since been refurbished and once again the heads of the states and governments stay there. The retrieved and restored art pieces now add to the elegance of the iconic President’s office, Morning Room, Committee Room and Yellow Drawing Room. The next project Mukherjee undertook was the documentation of the artworks and history of Rashtrapati Bhavan. Achal Pandya of the Indira Gandhi National Centre for Arts (IGNCA), who was in charge of documentation and restoration, says it took him three years to research to document the history of the Rashtrapati Bhavan, which finally came out as a nine-volume work. “It was next to impossible to document each and every thing in detail in three years. But surely this compilation can be used as an authentic blueprint by researchers in future,” he says. Mukherjee engaged the Indian National Trust for Art and Cultural Heritage (INTACH) to prepare a comprehensive conservation plan for the Bhavan, which, he hoped, could be modified for future conservation projects at the Bhavan. Disused stables and garages have been turned into an iconic story-telling museum, which is thronged by visitors. More functional spaces have been created by restoring old and crumbling parts of the complex for public functions. Right at the centre of the grand Rashtrapati Bhavan complex lies the 13-acre Mughal garden. Managing the garden is a herculean task. Some 3,000 people live in the presidential estate, so there’s a strain on the water supply. The president decided to deal with this by creating a sewage treatment and water recycling plant on the estate. Writer Amitav Ghosh, who spent time at Rashtrapati Bhavan as part of the in-residence programme initiated by Mukherjee, tweeted a picture of the plant during his stay there. There is an informed egalitarianism at work in the in-residence programme. If writers like Ghosh and activist-organisation builders like SEWA founder Ela Bhatt have been invited, so have unlettered villagers whose innovations have made a difference to the lives of people. So far, 200 people have participated in the in-residence programme. Many of the president’s in-residence guests have only one word to describe the experience: “Unique!” They seem as much in awe of the red sandstone complex as of the president’s warmth. Bhatt calls the in-residence programme a “historic initiative”. “Inviting citizens of India to the home of the president of India as his guest is one more step closer to true democracy,” she says. Of her stay, she says: “The large window opening to the gardens, the understated beauty of red sandstone and large rooms, and the architecture of Lutyens! I can say that this is the most delightful experience. A group of students from Banaras Hindu University (BHU) were excited after visiting the Rashtrapati Bhavan. One of them said, “Ashoka Hall is mesmerising. Its art and architecture is a mix of three cultures...there’s a statue of Buddha on the front wall that impresses everyone. As the guide told us, the heights of Rashtrapati Bhavan and India Gate are the same. One can read such things in books but can feel and experience them only after coming here.” The students were also in awe of the story-telling museum. “It tells us about all our presidents, the history of freedom movement and even the colonial era moments. King George V’s crown or the statue of Queen Elizabeth, which is carved out of a single piece of marble... these are also worth watching,” one of them says. Veteran journalist Sushma Ramachandran, who has covered major swearing- in ceremonies at the Bhavan, says, “The tour of Rashtrapati Bhawan was fascinating. I had only seen the Durbar and Ashoka Halls and the lawns. The immense size of the property made me realise that this mansion is a treasure for the country. It is commendable that it is being maintained as a historical monument, where we see history unfold before us in every room. The museums are especially enlightening and every student of Indian history needs to visit them.” Sushma had led a 30-member group of journalists from the Indian Women’s Press Corps through the Rashtrapati Bhavan on the president’s invitation. At the exit of the museum is a group of 200 women from Delhi’s police colony. “Kabhi sapne mein bhi nahi socha tha humein yah sabh bhi dekhne ko mil sakata hai. Yahan itni unique chije hain. (We had never even dreamt of seeing all this. This place is full of unique things),” says one of them. The original drawings of the President house, as it was being planned by Lutyens in 1913, and of the North and South blocks (designed by Lutyens and Sir Herbert Baker) are awe-inspiring. As a student of history, I had always wondered how Lutyens may have drawn the plan for such a grand building. I could also see the original manuscript of the Constitution in the museum enclosed in a glass case. I could turn its pages with the swipe of my hand. Mukherjee has also been instrumental in connecting innovators to central universities and other institutions. He set up innovation clubs in each university and trained a team of inspired teachers. He believed in allowing thousands of ideas to grow and turn into innovations at college and school level. The festival of innovators was a culmination of his efforts to put innovators face-to-face with researchers and academia. As president, he adopted five villages in Haryana with the purpose of nurturing talent and promoting innovations. Mukherjee could have limited his task to delivering fine speeches and giving some suggestions to change the system during his visits to the universities but he chose to do much more. In fact, he intervened to improve standards at the IITs, the IISc and the IISER. He revived the tradition of holding meetings of central universities, as also of higher and technical institutions, at Rashtrapati Bhavan. He also organised a visitors’ conference, where industrialists could put forth their demands for innovative solutions before the scientific community. This has resulted in 100 research agreements being signed between universities and industries in two years. He also invited experts to tell the central universities how to improve the international ranking of their institutions. Mansukh Prajapati, inventor of a mud refrigerator, who is originally from a village near Morbi in Gujarat, was among those invited to stay at Rashtrapati Bhavan for 10 days. He says his time there was “unforgettable”. “My innovations – a mud fridge, a mud hotplate and a mud cooker – are on display in five Haryana villages that the president has adopted,” he says proudly. Ajay Kumar Sharma of Varanasi is the inventor of a device that can help fill cooking gas cylinders with biogas. As a presidential guest, his work too will be on display at the villages adopted by the president. Similarly, Paresh Panchal’s cowdung flowerpots and an agarbatti-making machine got him invited to the Rashtrapati Bhavan. “My stay there was like a beautiful accident; it changed my life and my business too,” he says. 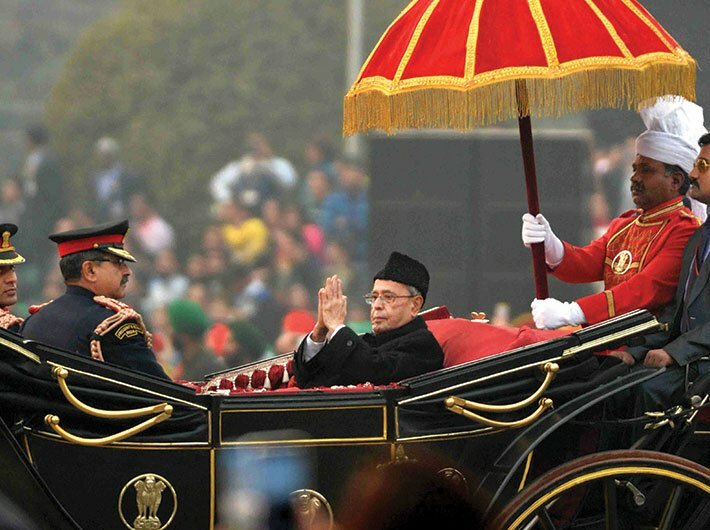 As Mukherjee gets ready to bid adieu to Rashtrapati Bhavan, he would have the satisfaction of accomplishing a mission. He certainly did not want to spend five years just signing on the dotted line, making ceremonial speeches and formal appearances. He seems to have found a way out – and in the process, has left a mark.